The Audience module provides the ability to create custom lead forms which allow you to capture viewer information as videos are played inside of Brightcove players. The lead data is sent to, and processed by, Salesforce. Create a form in Salesforce. Copy and edit the form HTML. 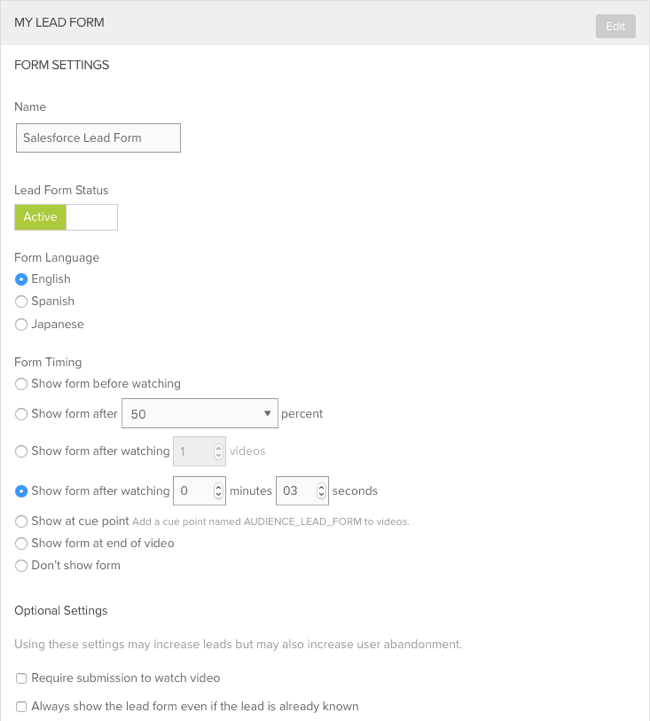 Validate the form data in Salesforce. The Web-to-Lead feature in Salesforce can be used to generate lead information from website visitors. These forms can also be displayed inside of Brightcove players. The steps below will create a simple form to capture first name, last name, email address, company, city and state/province. For complete details on the Web-to-Lead feature, see the Salesforce documentation. Sign in to your Salesforce account. From Setup, enter Web-to-Lead in the Quick Find box and then click Web-to-Lead. Select fields to include on your Web-to-Lead form. Use the Add and Remove arrows to move fields between the Available Fields list and the Selected Fields list, and use the Up and Down arrows to change the order of the fields on your form. Enter a Return URL. For this example, the Return URL will be set to http://www.brightcove.com. This value will be ignored when the form is used as a custom lead form inside of the Audience module. Click Generate. The form HTML will be displayed. To use the form inside of the Audience module, you will need to copy the form HTML. Also, you may want to do some basic styling to the form. In the steps below, we will copy the form HTML to an HTML editor and then make some styling changes to the form. By default, when the form is displayed inside of a Brightcove player, the form will display on a transparent background over the player. Use CSS to set the background color. Copy the HTML to the clipboard. Using your HTML editor, add the following CSS to change the background color to grey. 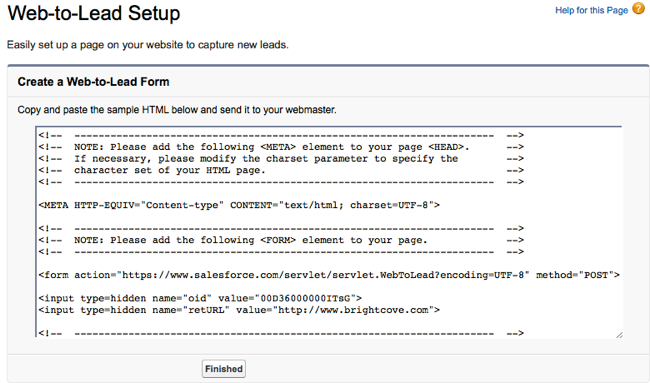 Once the form HTML has been generated in Salesforce, create a custom lead form in the Audience module and associate the lead form with an Audience-enabled player. 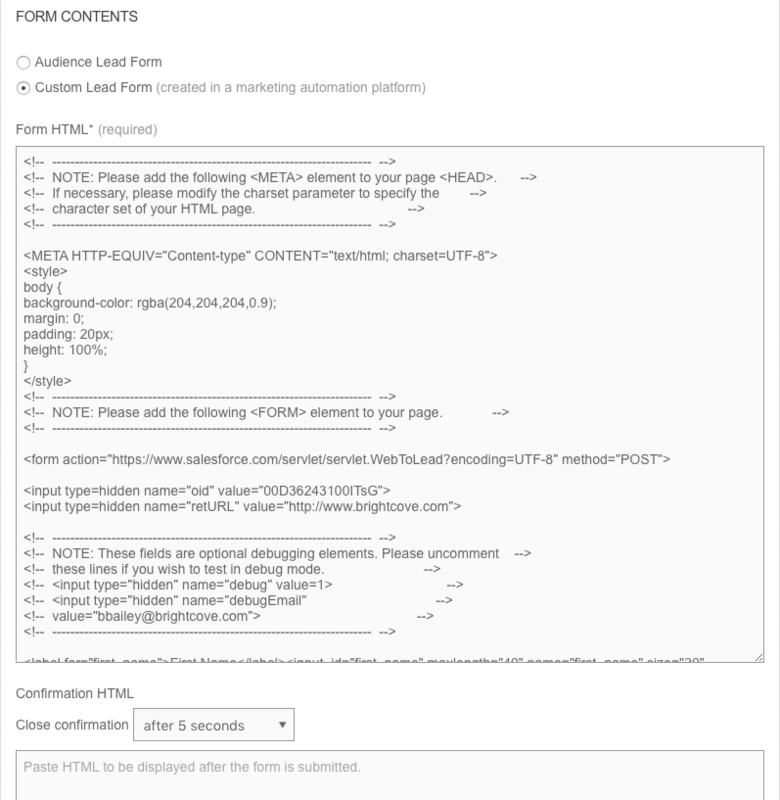 Paste in the Form HTML from Salesforce. 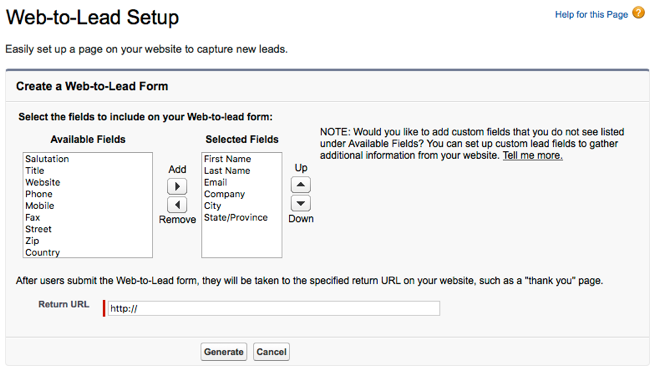 Leads captured using the custom lead form will be added as leads in your Salesforce account.